That’s what Middleton’s girls basketball team was singing from the top of its collective lungs after destroying Madison East, 56-28, last Friday. The Cardinals were giddy to welcome back preseason all-state forward Liz McMahon. McMahon missed the first month of the season with a broken finger, but made her debut a memorable one with a game-high 18 points. Middleton improved to 3-2 overall and 3-1 in the Big Eight Conference. The Cardinals are in a three-way tie for second place in the league, one game behind Janesville Parker. But with McMahon back, Middleton has a chance to become the kind of team Kind envisioned before he lost his best player. 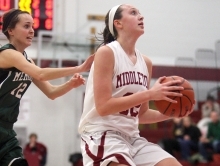 Middleton, ranked seventh in the latest state poll, won two of its three games last week and improved to 6-1. The Cardinals toppled Janesville, 4-2, last Tuesday and routed Madison East/La Follette, 13-0, last Thursday. Interestingly, the Cardinals’ best performance probably came in their 1-0 loss to Ashwaubenon last Saturday. In between, Middleton had a brush with the athletic code and will be without three players for six games. Middleton opened the week with a solid win at Janesville. The Cardinals trailed, 2-1, heading to the third period. 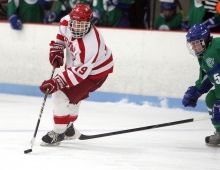 Middleton then rallied for three goals in the final period. It was another terrific week for Middleton’s wrestling team. The Cardinals took a big step towards winning the Big Eight Conference with a 45-24 win at Janesville Craig last Tuesday. The Cardinals then finished third at the 13-team Appleton West Invite last Saturday. Appleton North and Little Chute won the tournament with 198 points each, while Middleton was a close third (195.5). Middleton senior Jake Cain improved to 18-0 on the season by winning another championship at 138 pounds. Taggart Haase also finished first at 170 pounds, while Wyatt Cory was third at 195. Brett Cain (113), Grant Laurent (152) and Lon Yeary (220) all finished fourth. Jake Cain had a memorable day, pinning all five of his opponents. Cain was also named ‘Outstanding Wrestler’ of the tournament. It wasn’t the outcome they wanted. But there were several encouraging performances in Middleton’s 97-77 loss to Madison West in a boys swimming meet last Thursday. “The West meet went well,” Cardinals coach Luke Lengfeld said. “We didn't get the outcome we were looking for, but the boys swam very well and battled to the end. There were several positives in the loss. Middleton’s Jackson Uselman won the 100-yard freestyle (48.50) and the 200-yard freestyle (1:49.59). Zack Parkin won the 50 yard freestyle (22.01), Nick Lund won the 100 yard fly (54.68) and Matthew Kim was first in the 100 yard breast stroke (1:04.40). Middleton’s 200-yard free relay team of Uselman, Jack McGovern, Lund and Parkin was also first (1:29.20). It was all right there for the taking. A four-point lead. Less than a minute remaining. A chance to make an enormous early-season statement. And then it all slipped away. Middleton’s girls basketball team led visiting Janesville Parker, 48-44, with 53.3 seconds left last Thursday. But the Vikings answered with a stunning 8-0 run and held on for a 52-50 win. Middleton, which has won at least a share of six straight Big Eight Conference titles, had the preseason favorite Vikings on the ropes throughout. The Cardinals, playing without all-state forward Liz McMahon (broken finger), were the scrappier team all night. When it comes to playing games on back-to-back nights, Luke Schafer said a little depth can go a long way. Schafer’s layup off a backcourt steal helped spark a key scoring surge in the third quarter as Middleton rolled to a convincing 68-45 victory over visiting Madison West in a Big Eight Conference boys basketball game Saturday night. The quick turnaround couldn’t have come at a better time for the Cardinals, who dropped a hard-fought 61-53 decision at Madison East on Friday night. Middleton’s wrestling team finished third at the 16-team Tomah Scramble last Saturday. Lancaster won the event with 445 points, while Lodi (392), Middleton (362) Caledonia (360) and Neillsville (342.5) rounded out the top five. 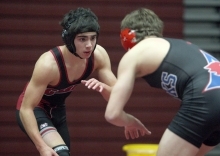 Cardinals senior Jake Cain finished first at 138 points, pinning three foes along the way. Cain received a bye in his first match, then pinned Lodi’s Adam Phillips in 45 seconds. Cain followed with pins of Baraboo’s William Pierce in 1:40 and Lancaster’s Joe Crosby in 1:01, then won by injury default over Caledonia’s Luke Werner. Taggart Haase also enjoyed a big day, finishing second at 170 pounds. Haase opened with a pin of Mosinee’s Jacob Sparby in 3:07, then captured a 6-2 decision over Viroqua’s Clay Fitzpatrick. Haase followed with an 8-3 win over Mitchell Pohlman of Neillsville, lost an 11-1 decision to Lancaster’s Ethan Soderstrom and toppled Cashton’s Brandon Schmitz, 7-3. Kari Egan-Steck always has great expectations. But Middleton’s girls gymnastics coach likes to temper them for the first meet each season. This year, that probably wasn’t necessary. The Cardinals opened their season last Tuesday with an impressive 134.625-132.275 win over visiting Mount Horeb. These two programs know each other well from club gymnastics and traditionally open the season against each other. It leads to a meet that’s usually more friendly than fiery. “It is a low stress, friendly meet that the girls have a lot of fun with,” Egan-Steck said. It was a busy — and highly successful — week for Middleton’s boys swimming and diving team. The Cardinals took second place at the Brookfield East Invite last Tuesday. Middleton then defeated Madison La Follette and Janesville Parker in a triangular last Friday, and finished second at the Janesville Parker Relays last Saturday. Madison Memorial won the Brookfield East Invite with 593 points. Middleton was a distant second at 391.5, but the Cardinals finished ahead of traditional state powers Brookfield (299.5) and Hartland Arrowhead (284). “We ended up beating Arrowhead and they took second at state last year,” Cardinals coach Luke Lengfeld said. Middleton had several terrific performances on the day. 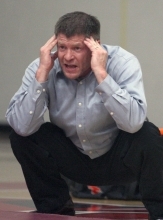 Middleton’s wrestling team entered the year flying below the radar of most. But that might have changed last week. 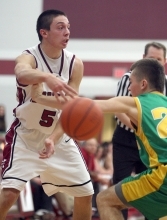 Middleton toppled perennial power Hartland Arrowhead, 44-26, last Thursday. The Cardinals then finished second at the eight-team Reedsburg Scramble last Saturday. A year ago, Middleton was drilled by Arrowhead. But 12 months later, the Cardinals took the fight to the Warhawks. Middleton got pins from Lon Yeary (220), Sean Benedict (heavyweight), Brett Cain (113), Nathan Dresen (182) and Wyatt Cory (195). 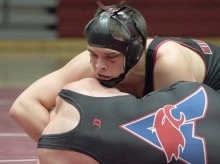 Middleton also got wins from Justin Swiersz (126), Jake Cain (138), Shay Haase (160) and Taggart Haase (171).